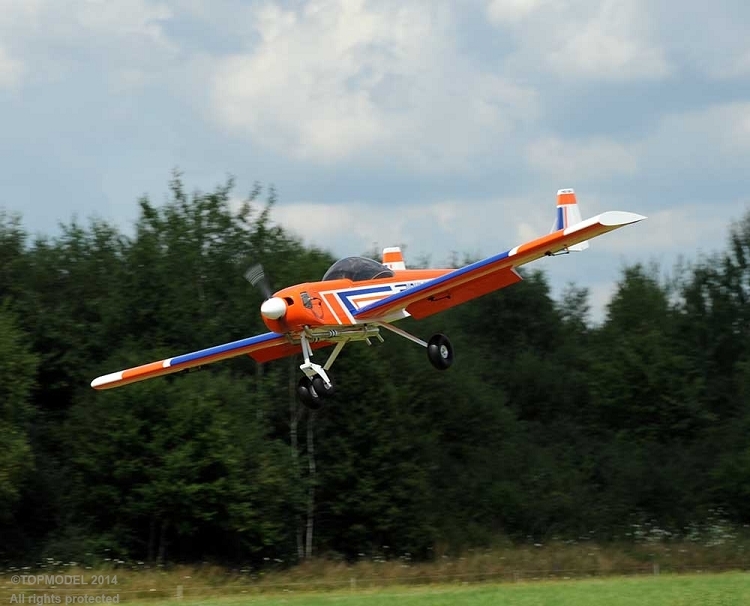 The scale RC gliders are becoming larger and larger, heavier and heavier, and it was time to design a capable tug to tow in altitude such exceptional models. So, we had to design an exceptional towing machine too! The BIDULE formula is unanimously appreciated thus Topmodel decided to make a new version, even bigger, of its bestseller tug, and for engines like DLE 170. With almost 3.5 meter wingspan, the BIDULE 170 is the most stable and most accurate among giant towing machines, with perfect controls rarely seen so far! 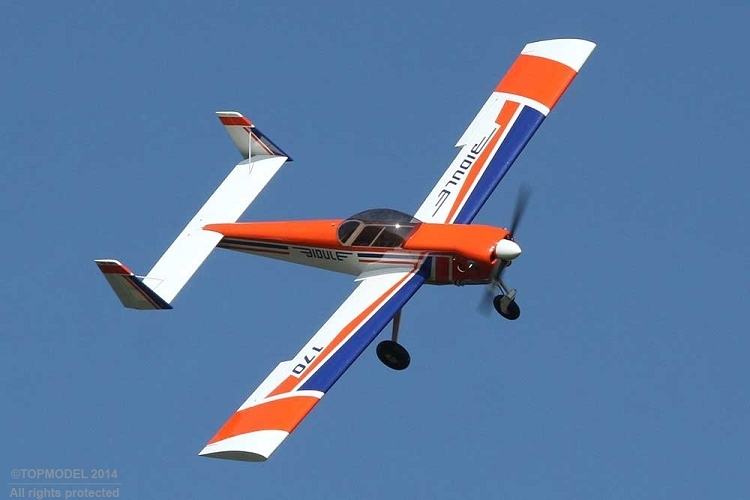 His power allows her to tow without anxiety even the largest gliders, while the flaps allow her to land easily and the sturdy landing gear is happy with summary prepared grass strips. No revolution, but an evolution of the concept, because in this size, design of some elements, like the landing gear is closer to the size of real aviation rather than model size. 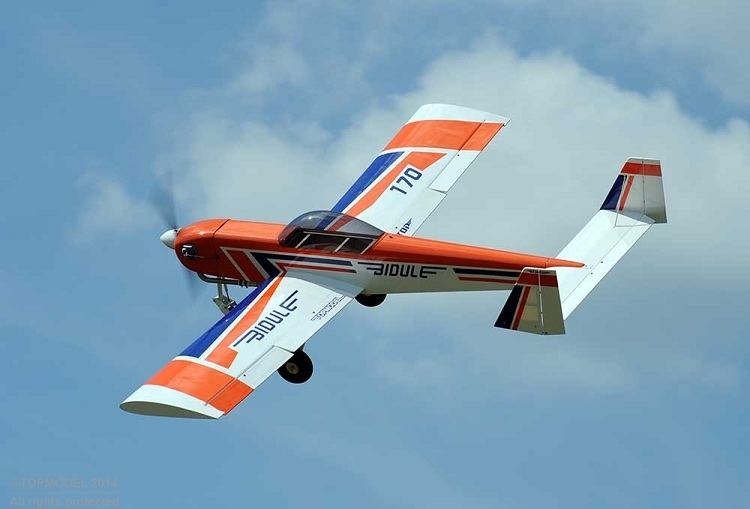 Like other BIDULE, the airframe structure is wood, the engine cowl and the main gear made of fiberglass, the front gear is damped by a gas cylinder. Tubular carbon wing joiner and covering material OracoverÂ®. The firewall is prepared for mounting the DLE170 capable of 35kg traction! 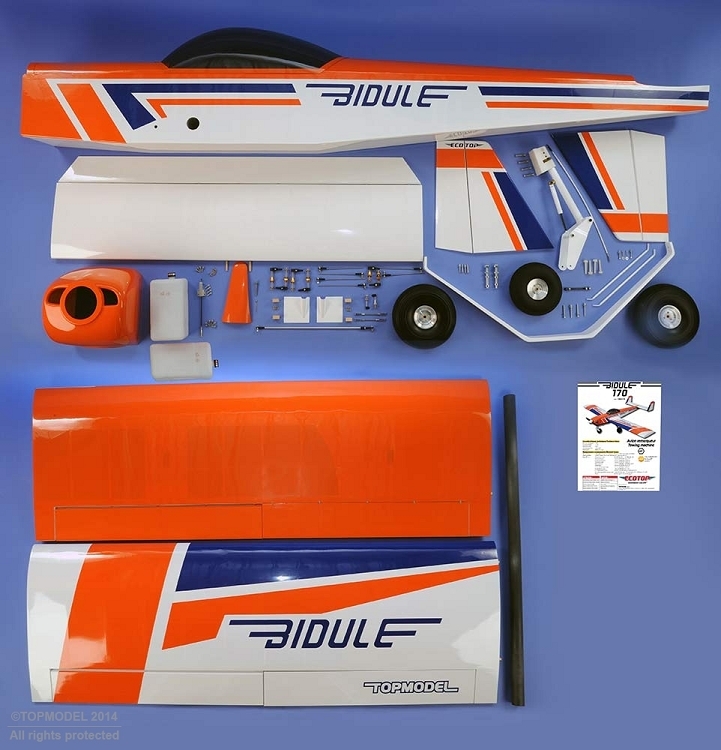 All built-up plywood and balsa fuselage, covered with OracoverÂ®, with graphics and decals. Pocket for wing joiner installed - Geometry of the airframe already made at the factory. All the blind nuts for landing gear, wings, tail already in place. Painted and tinted PVC canopy, ready to be installed. The canopy frame is made in balsa and comes pre-covered, with its canopy fixings pre-installed. Painted fiberglass main landing gear. Special front dampened and Steerable-Nose gear, complete with special steering wheel linkage with "Servo-saver". All-built-up wings (2 parts), covered in OracoverÂ®, ready with graphics. Ailerons and flaps articulated with pin hinges (to be glued). Servo wells prepared. All-built-up horizontal and vertical stabiliser covered in OracoverÂ®, with graphics pre-fitted. Elevator and rudder articulated with pin hinges (to be glued). Hardware (2x1,5l gas tank, 3 wheels, towing hook, metal control horns, wheel axis, pushrods, clevises, screws, etc.). Detailed step by step illustrated building manual.